The overall objective of the project is to contribute to sustaining the democratization process and enhancing conflict sensitivity in the Western Balkans through reforms and implementation of changes in the formal schooling system that will intensify democratic education. The project strives to achieve that education authorities and civil society jointly reform education and schools in the region to enhance critical thinking and active citizenship. These two competencies are key drivers of all forms of development, but particularly of the development of a vibrant civil society that is ready to protect and defend democratic values, gender mainstreaming, environmental protection and a culture of non-violent conflict resolution. EUROCLIO is leading this part of the project, which is composed of a Needs Assessment study and national peer-training events organized by the local partners, EUROCLIO member associations in the region. With several rounds of feedback by the Standing Working Group members, participants to the 2016 Regional Summer School in Montenegro and over 300 educators from across the region during 6 national seminars, the survey underwent a thorough review process before it is launched. By reaching out to history educators across the region to share their perspectives, the survey results will produce an evidence base that will form the basis of new curricula transformation strategies in the region. For more information on the survey, check back here soon. With national training seminars the project aims to train individuals who will be able to act as trainers for peers and who will be able to multiply the competencies for multi-perspective and participative lessons. Eventually this will equip students with the empathy and the skills necessary for turning complex conflicts into constructive solutions. CDRSEE is the lead partner for this part of the project. Joint advocacy and regional cooperation is crucial to establish and strengthen collaboration amongst civil society, educators and policy makers on the regional level. The main means to foster this cooperation is the Standing Working Group on History Education that is led by EUROCLIO, and the Standing Working Group on Didactical Reform that is led by CDRSEE. In 2017 a capacity building regional summer school will form another platform for exchange and cooperation, building also on the results of the first outcome, the evidence base. 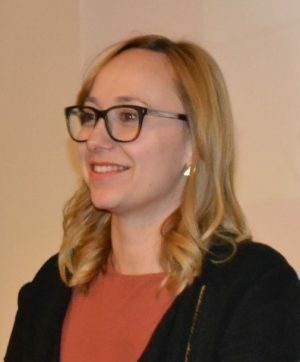 Dea Marić holds an MA degree in History and Sociology. She currently works as a project coordinator in a civil society organisation Documenta – Center for Dealing with the Past from Zagreb on programs of documenting, public advocacy and education for dealing with the past. She is also a Teaching Associate at the Faculty of Humanities and Social Sciences, University of Zagreb on courses related to History Teaching Practice. Her research interests fall in the fields of history education, educational standards, strategies and practices. She is actively engaged in several national, regional and international initiatives and organizations for promotion of human rights and innovation of history and civic education. courses (Cultural Psychology, Decision Making, Statistics for Experimental Research). 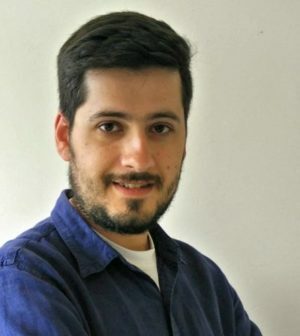 He holds a diploma in Psychology from the Faculty of Philosophy, University of Belgrade and a MA in Interdisciplinary Research and Studies on Eastern Europe (MIREES) from the School of Political Sciences, University of Bologna and Faculty of Social Sciences, University of Ljubljana. He is currently involved in several educational projects dealing with history teaching and dealing with the past. His research interest is in combining perspectives of social psychology and political science in understanding post conflict societies. 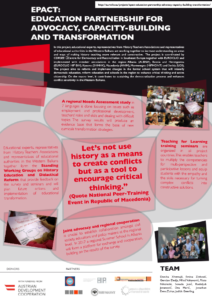 Within this project EUROCLIO brings together educational experts, representatives from History Teachers Associations and representatives of educational authorities in the Western Balkans within the framework of the Standing Working Group on History Education. The experts enter into a collaborative and engaging reflection on best ways to conduct a wide-ranging needs assessment that will shed light and increase understanding on areas and ways of making history teaching more relevant and constructive, centring on the need to gather a substantial evidence base while serving the needs of policy makers to identify gaps, needs and opportunities. They will discuss the findings of the Needs Assessment and plan future actions and implementation of educational transformation.